A mobile device app needs to transfer sensitive information to a backend system. It is highly critical that this data is not accessed by any third party. SERA is integrated into the app and the backend system is configured accordingly. When a network connection is established, the correct APIs are applied. 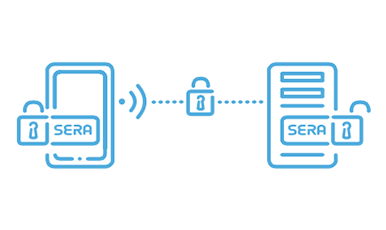 SERA authenticates both the app and the backend server, thus guaranteeing a secure end-to-end connection. All data is transferred in an encrypted format that meets the latest encryption technology standards. Your data is guaranteed to be secure and not compromised by any third party – at any time. It’s protected while being read, written, transferred and received. You are responsible for the efficient protection of local data stored in an app on a mobile device from third-party access and other apps. SERA is integrated into the app and the related APls are applied when reading and writing. 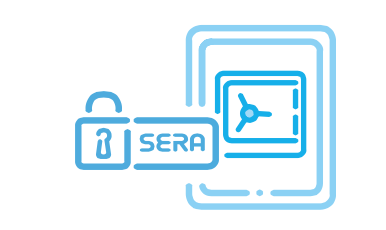 SERA handles the entire key management system, including the application cases. All the is stored securely, using state-of-the-art encryption methods. Your data is secure – and you can prove its security thanks to SERA’s documentation.